I did see the episode. I thought the combination of Bran’s flashback to young Ned’s sword fight in front of tower and Jon Snow’s resignation from the Night’s Watch was potentially quite revealing. Tower of Joy was filmed at Castillo de Zafra in Campillo de Dueñas, Spain. Nonetheless, when Jon quits the Night’s Watch in the same episode as R+L=J is dangled so tantalizing close, in my deluded mind, it clears the way for a highly romantic and heroic ending: Jon and Daenerys marry and rule Westeros together. The name of the episode is curious. Oathbreaker. Game of Thrones‘ episode names usually imply a thematic grouping. So, who broke their oaths? Jon Snow, presumably, did not break his oath because he died. His watch ended when he died. If there is any truth to R+L=J, did E keep his promise to R? Is that the broken oath? I strongly suspect Arya is lying to Jaqe’n Hgar about being nobody. But, is that an oath? To the Dothraki, Daenerys may have broken her implied oath to live as a widow at the Dosh Khaleen temple. Are there broken oaths that I’m missing? Thoughts? Sorry to hear that you had family events happening and sending you my love. This week’s post episode page is wonderful though. I love that ( even though due to unexpected emergency) you’ve ‘mixed it up’. It looks great. Luke Roberts, the British actor, was fabulous in the part. His fellow British actor, Robert Aramayo, totally nailed it as the Younger Ned too. I am an utterly convinced R+L= J theorist, so to hear the plaintive cries of Lyanna Stark ( it has to be..) coming from inside the Tower gave me shivers. My ideal fantasy GoT flashback would be Rhaegar Targaryean laying eyes on Lyanna Stark at the Tourney at Harrenhall. Thus begins a war that shakes the world! A smaller real history comparison can be made there with King Edward IV and his passion for Elizabeth Woodville. War was a consequence of it (as in his conflict with the Earl of Warwick over it) and eventually- it can be argued – this passionate coupling led to the downfall of the Plantagenet dynasty. As to broken oaths. Yes I agree with you, I cant quite bring myself to believe Arya’s ‘No One’ assertions. I think that the loss of self is the oath of sorts to The Faceless Men and the God of Death but I feel that Arya’s hedging her bets. 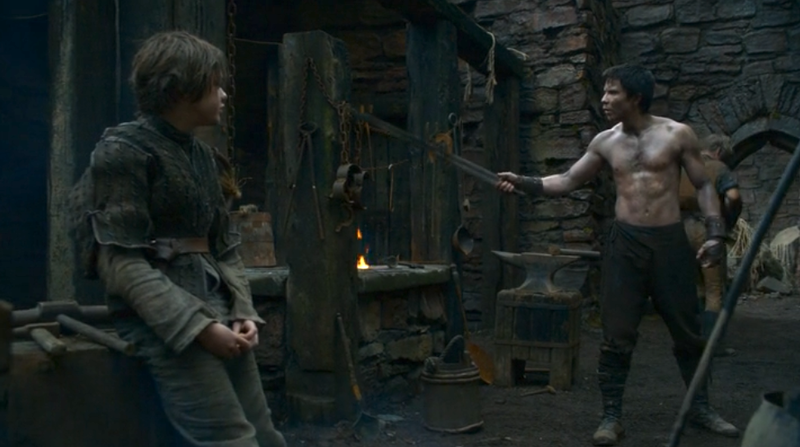 I also think The Faceless Men have other, bigger plans for her – hence the mention of Arya’s ‘Kill List’. Their God demands death and lives… but if other faiths and their god are going about bringing back the dead, the Faceless Men may well want to go after those who act in the name of this god and faith… just like a certain Red Priestess. I agree with all the broken oaths you’ve highlighted above and also want to mention that Smalljon Umber (fabulously sweary and played by the fab Dean S Jagger!) didn’t bend the knee and actually swear ANY oath to Ramsay. This was a lovely comment. I think it really helped make up for the lack of recap last week. I appreciate it a great deal. Your family must come first always, Jamie and I do hope things work out well in that regard. Martine, you make some valid points. I regret my mind is not as alert as yours today so I can’t come up with fresh suggestions. I suppose the killers of Jon Snow were oathbreakers though that happened in an earlier episode. I may be the one person in the universe who felt a bit sorry for Olly – I know he was a show only character but he was just a kid. I’m still upset about Shaggydog. Watcher, Thank you so much. It has been a really rough week, but my mom is now doing quite well. I felt sorry for Olly too. In fact, I think Jon Snow even felt (sort of) sorry for Olly. Yet another tragedy of war (and faction). I’m quite worried about Rickon as well. Glad to hear your mom is doing well. There were four hanged mutineers, four oathbreakers. D&D are very much into symmetry in their shows. Notice how Howland Reed’s dagger to the throat in this episode was so much like the spear to the back of Tristane. There were four hanged mutineers, so we should look for four oathbreakers. Jon’s position is complex. It wasn’t just the literal oath that bound him, it was the moral force of the oath. The leaders of the NW stabbed him to death. The oath is therefore void. The Watch broke faith with Jon, not the other way round. Danny’s position is also complex. She was not a Khalisar by choice. Why is she obliged to go to a home for Kahl’s widows? The Umbers are breaking their oath to the Starks. Or are they? Lots of people see a hidden plot there and so do I. The only problem being that when Redshirts try to be clever it invariably comes off badly. Umber refuses to take an oath to Ramsay. Another possible broken oath is the son of the harpy that Varys persuades to turn informer. But again, we discover that they are mercenaries. What oath has been broken there? So when we look at each of these oathbreakings, they are all heavily hedged and excused. The only men who really broke their oaths were the mutineers that Jon hanged as his last act as Lord Commander. “In my mind, Game of Thrones always ends like a Bollywood musical. The hero and heroine kiss while back-up dancers sing and twirl.” Hahahaha, Jamie, this really made my day. I wish GRRM would heed such fabulous advice. Seriously, I’m so sick of all the doom and gloom. Shaggydog was the last straw! I’m this close to chuck the whole series. At this point I think R+L=J is pretty much a done deal, but then so what? Jon Snow can ride a dragon? To do what? Melt the Others and their wights army? It remains unknown. As for what the Faceless Men are doing, or what their god of death is up to, I kind of have a theory that there may be only one god in this universe. Or maybe two magical forces, if the Ragnarok theory holds true. Maybe Old Gods (the Starks and the Others?) versus the Andals (the Seven?). Where the other various gods and dragons fall in this battle remains to be seen. Hi, am I the only one who noticed that Sir Arthur Dayne was stabbed in his back while he was fighting Ned and if you look at the deaths of every dead member of Ned’s family including Ned, technically they all had been stabbed in back (killed by treachery)! GRRM is interested in poetic justice in this case, i guess! Very clever observation. I like it. 🙂 I agree. I think GRRM really likes poetic justic as well as translating reality in metaphor and vice versa. ATIF – I agree. Very revealing. However in the show anyhow, was it not Howland who killed Ned? Also at this point, they might have been confused as to what the Kingsguards were actually doing. Maybe it didn’t occur that they might have been protecting Lyanna at this point. Typo – I mean it was Howland who killed Arthur Dayne (not Ned!). Hence, it really ought to be the Reed family experiencing the poetic justice, not necessarily the Starks. Looking forward to discovering more about the Reeds. Lol. Well, my guess is that they probably are aunty and nephew. But that’s never stopped the Targaryens before. 😉 Yeah, I know… Yuck! I’d never thought of Jon being a Baratheon. I’ve often wondered what happened to Cersei’s first son, the only one she had with Robert. Did he really die? I keep waiting for him to turn up somewhere. Also, thanks for saying such nice things! I’m glad you enjoy the site. It’s such a great site isn’t it? So glad you love it! It depends on whether R+ L=J is right… if it is ( YAY !) and Jon is the offspring of Rhaegar Targaryean and Lianna Stark, then that would make Jon the nephew of Daenerys – as Rhaegar was the eldest brother of Daenerys. If not… …..well then, all bets are off! 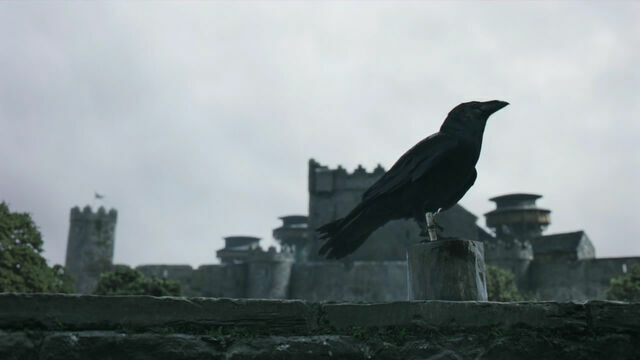 My feeling is that Episode 9 (I think) may give us the big reveal about Jon’s parentage, with another flashback to The Tower of Joy. You know how much I love this site and what you’ve created here, Jamie! P.S I’m one of the die hards who stays up til 2am UK time to watch the episode simultaneously with America/Canada. Will the final battle for throne be between Daenerys (Fire) and Jon Snow (Ice) do you think as the overall title for books is Fire & Ice then?? Also- it may be that The Iron Throne etc becomes totally irrelevant if Mr Frosty and his gang get to Westeros…. But this is GRRM and Dan/David- so we don’t tend to get much in the way of happy endings…! Last week, when they had Mad King Aerys included in Bran’s flashbacks (‘Burrrn them aaaaall!’ LOL) and then they pretty much cut to ‘Daenerys rouses the Dothraki masses from the back of a Bloody Great Dragon ‘ I wondered if they were trying to imply that the old ‘Targaryean Madness’ was starting to show itself in Daenerys.